It was the economist John Maynard Keynes who said that in the long-run we are all dead, so an initial response to the Treasury’s attempt to assess the “dynamic effects of fuel duty reductions” might be: what’s the point? But this would be the wrong reaction. First off, in this analysis of the impact of a continued freeze in fuel duty the Treasury has defined the long-term as 20 years: still a long way into the future but not out of step with other modelling and predictive work such as the Department for Transport’s traffic forecasts for 2040 published last summer. Also, if policy makers are not prepared to think through the consequences of their actions then mere voters might well ask whether they are fit to be making such decisions at all. For these reasons this is a welcome initiative. To be fair there have always been assessments made of at least the direct impacts of a fiscal change. For example the freeze in duty announced at Budget 2013 showed an immediate £480 million cost to the Exchequer. But now those in charge want to look more widely. The difficulty of the task is underlined by the ‘ifs’, ‘buts’ and ‘maybes’ that litter the text but that is no reason to be dismissive of the attempt or the conclusion. It does however raise the real issue of how far out you try to measure the ripples and at what stage they get so interfered with by other policy interventions that they are impossible to distinguish. The work says externalities such as increased traffic jams and air pollution have not been considered, though the report concludes that “it is not expected that the impacts on congestion would have a material effect on the main findings of the report”. Of course to draw this conclusion someone must have done a calculation and if that has been done shouldn’t it have been included? The modelling does show “fuel duty to be one of the most distortive taxes.” The implication of this is that shifting the taxation balance to other goods and services which currently attract lower rates of tax would be preferable if the aim is to maintain constant revenue for the Exchequer. More generally, what this research does potentially allow for is a strict financial assessment of proposed tax changes. It is similar to the principle of standardised Benefit Cost Ratio (BCR) calculations which allow a useful way of comparing apples with pears. However the architects of this new Computable General Equilibrium (CGE) model will ultimately face the same reality those in the DfT encounter when they present the BCRs of competing transport schemes to ministers. Whatever the numbers say, the decision on what goes ahead and what doesn’t will be as much about politics as anything else. From an intellectual point of the view, the real test of CGE will come somewhere down the line when the next generation of Treasury officials revisit these forecasts and testify to their accuracy, or not. Retrospective evaluation is a key component of most public projects. It should be here too. The real disappointment would not be that this modelling turns out to be wrong but that nobody bothers to find out. The latest ‘Family Spending’ report from the Office for National Statistics published earlier this week says that the average UK household spent £489 per week in 2012. Approximately 13% (£64.10) of this went on transport. Interestingly, this was the first year since 2001/02 (when the data were first collected in a comparable form) when transport wasn’t the biggest single area of household expenditure. Housing and fuel costs rose from £66.40 in 2011 to £68 in 2012 to ‘top the poll’, whilst transport spending fell from £67.20 in 2011. So why are people spending less on transport? Probably not because it is getting any cheaper to run a car but rather the opposite; transport remains expensive but the cost of domestic heating is also rising significantly and hard choices have to be made. But adapting travel habits only goes so far and in spite of these likely cutbacks the latest data indicate that the average UK household is still spending almost two fifths (38%) of its total transport expenditure on fuel. No wonder the chancellor used the recent Autumn Statement to confirm the freeze in fuel duty he had proposed at this year’s Conservative conference. Where does the money go? 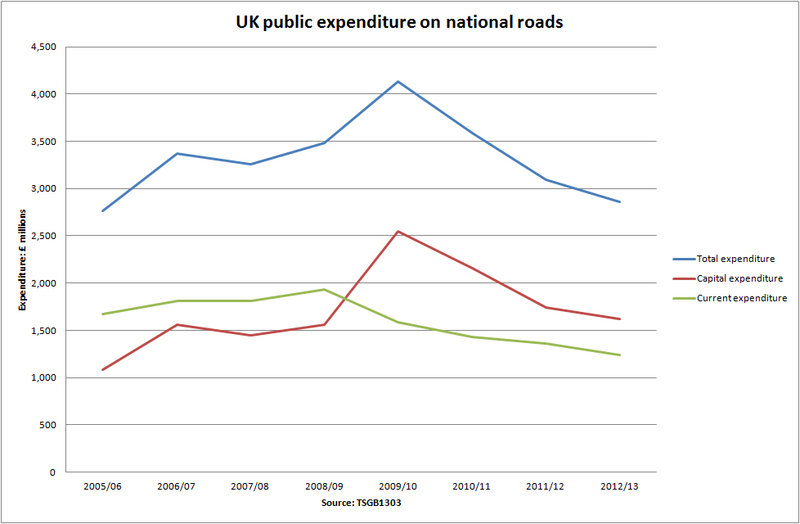 Spending on roads revealed. So we have today been told by the DfT that the Treasury collects about £27 billion from drivers each year in fuel duty and another £6 billion in VED. But what do motorists get in return? 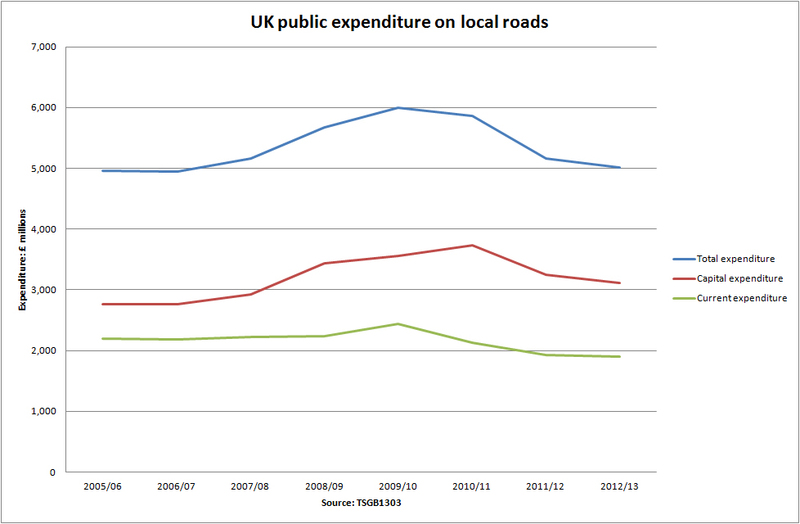 Well, helpfully, the DfT has also published data on UK road spending going back several years. The big question is where do we go from here? We know that capital spending on Highways Agency roads is set to expand in the next parliament (though this will back loaded towards the end of the five year period from 2015) yet local authorities continue to warn of road maintenance spending on the vast majority of the road network that is there responsibility will be under serious threat as budgets are trimmed and obligations in other areas grow. 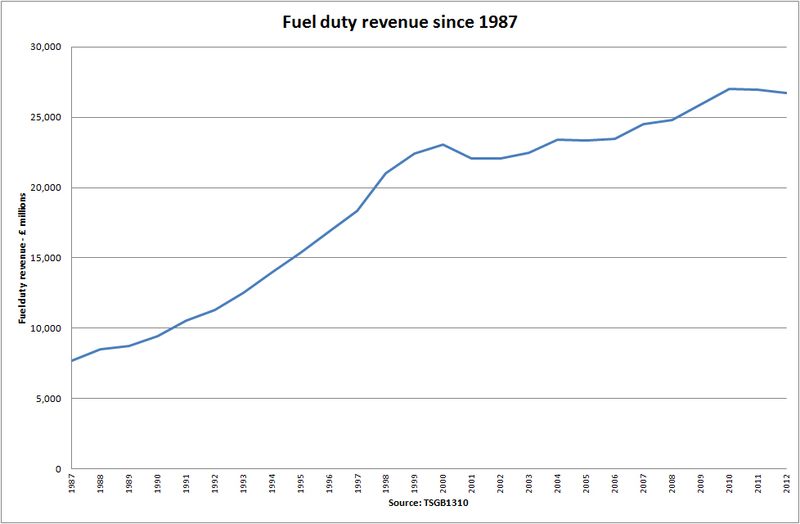 The Department for Transport has published a whole raft of data today including the Chancellor’s take from fuel duty between 1987 and 2012. The numbers are not insignificant. Unadjusted for inflation the revenue rises from £7.7 billion back in 1987 to a peak of £27 billion in 2010. In 2012 the Treasury’s income from duty on hydrocarbons was £26.7 billion. The graph below tells the story. Over the same period annual VED payments by drivers have grown from £2.6 billion to £5.8 billion. “That brings me on to fuel duty. “Instead of those rises, we abolished the escalator, and we have cut and then frozen fuel duty. “I’ve had further representations from many Honourable Friends, from the Member for Blackpool North and Cleveleys, to the Member for Argyll and Bute, and of course, the Member for Harlow who is such a champion of the people he represents. “I said earlier this autumn that if we could find the money, I’d like to go on freezing duty. “Today I can report that because we have taken difficult decisions to control the public finances, I can deliver on that promise. “Next year’s fuel duty rise will be cancelled. “Instead of petrol taxes going up by 2 pence a litre, they will stay frozen. “That means compared to the previous government’s plans, petrol will be 20 pence a litre less. “That’s £11 less every time you fill up. “A saving for drivers over this Parliament of £680. “Double that for a small business with a van. That might well be right and drivers will be grateful for today’s confirmation of the freeze trailed by Mr Osborne in his party conference speech. However, as shown by Fuel for Thought, written for the RAC Foundation by the IFS, motoring taxation accounts for about 7% of all the tax income the Chancellor receives and 60% of the pump price is still tax. For these are the locations for which the government is seeking permission from the European Commission to cut the rate of fuel duty and hence provide cheaper petrol and diesel at the pumps. The benefit is likely to amount to 5p per litre. The move is not unprecedented. Already the discounts are in place on the Scottish islands and Isles of Scilly. They are also to be found in other island communities in Europe. According to the Press Association part of the reasoning for choosing these areas is that they are “more than 100 miles by road from the nearest refinery, and have a population density lower than 135 people per square kilometre.” Extension to these ten places would mean more than 120,000 people in Britain benefiting from the scheme. Even for the vast majority of drivers who won’t be entitled to a discount there is good news: according to DECC unleaded fuel is currently averaging about 131.7p a litre, a price which has not been seen on a sustained level since the start of this year.